I’m in the process of writing a response post to a feminist who objects to “transgender” though not to transgender people… Unlike the hateful radfems, she has an honest desire to learn and understand, which I deeply respect and so am willing to engage and put forth the effort. This very week I discovered this amazing post, which largely corresponds with what I have already written. I’ll be using some of it’s ideas and providing a link to it. 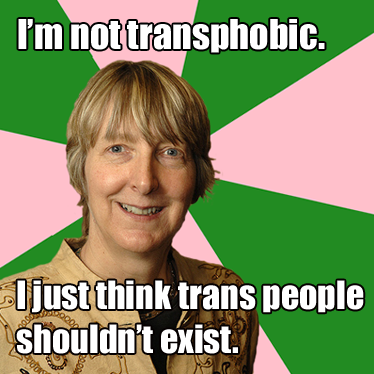 Any more good posts on Trans 101 for Feminists/Cis Folk are appreciated!